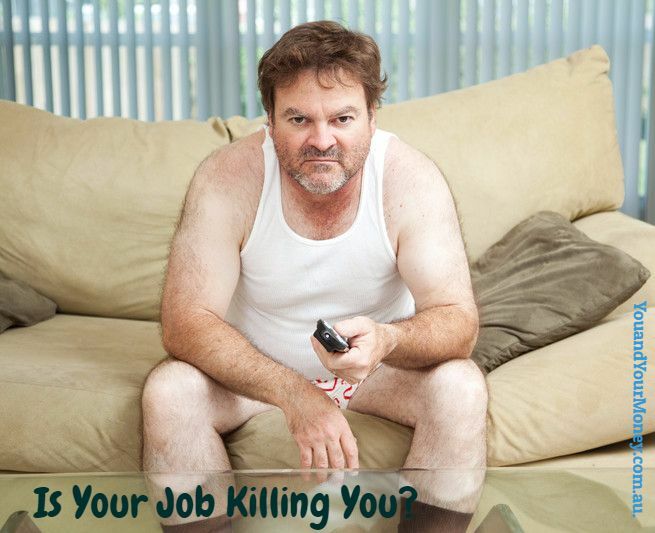 / Is Your Job Killing You? Research has found that adults sitting for at least eight hours a day could increase the risk of premature death by up to 60 per cent. In a paper published in The Lancet, Professor James Sallis a UCSD School of Medicine Distinguished Professor of Family Medicine and Public Health wrote that 23 percent of adults worldwide fail to meet activity guidelines. Anyone spending hours at their desk is urged to change their daily routine to take a five minute break every hour, as well as exercise at lunchtimes and evenings. It’s well-known that sitting down all day, be it at your desk, on the sofa watching TV or in a car, is bad for your health. People know they should be getting up regularly, stretching their legs and simply moving their bodies more, but how many actually do it? Keeping your body stationary for prolonged periods of time can increase your chances of developing a range of diseases, including certain cancers, type 2 diabetes, cardiovascular disease and stroke. An hour of brisk walking or cycling spread over a day is enough to combat the dangers of eight hours sitting in the office. Researchers believe that around 292,600 new dementia cases could be prevented globally each year with an increase in physical activity. Sydney Physiotherapist Brad McIntosh and his team treat pinched nerves, back pain and stiff necks all the time. His Sydney Physiotherapy Solutions clinic are based in the heart of Sydney CBD where the majority of his patients work 50 to 60 hours per week. “Body pain, herniated discs, nerve problems and painful joints are direct results of sitting down all day in offices”, says Dr. Brad McIntosh. “When you’re sitting, the spine is under a lot of pressure. Top Tips to avoid the dangers of sitting too long. Get on your feet and move throughout the day. Take short breaks regularly to walk around the office. Put your computer on a high counter or bookshelf, or try out a stand-up desk that allows you to stand up while working. Move around! Make conference calls on your feet or suggest a walking meeting. How many hours do you stay seated at your desk every day on average? Tell us below if you are suffering neck and back pains associated with sitting all day.